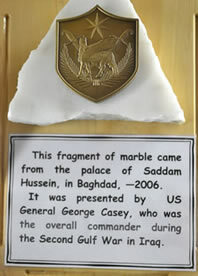 Here is an opportunity to view a very special collection of one man's life of service to his country. General John Cantwell was an officer, who was both a soldier and a mate to the men who served under his command throughout his time in the Australian Regular Army. This collection is a unique look into a life and dedication of a soldier who upheld the values of Australia wherever he went. 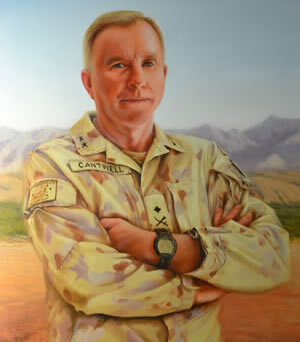 Whether it was the in the desert of Iraq in the First and Second Gulf War or his last command in the nightmare that was Afghanistan, John Cantwell was there in the thick of it all serving in the name of Australia. The photos shown here are but a fraction of what is perhaps the museum's greatest display to date. The life of a man whom we can be justly proud to have embodied the ANZAC Spirit. This born leader's own story is best explained in his compelling biographical book, 'EXIT WOUNDS'. 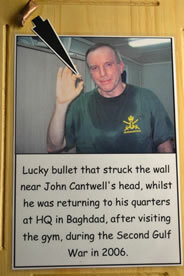 John Patrick Cantwell was born in Ipswich, Queensland on October 9th 1956. He grew up in Toowoomba on the Darling Downs, and undertook his schooling there as well. It was surely an indication of his future career pathway when he joined the Army Cadets whilst in High School. As a youngster John had been exposed to the Vietnam War like all Australians by way of television. Many a young man had been influenced by such a war, let alone the psyche of the ANZAC spirit that lived and breathed throughout Australian society. Whilst training at Cadets, John met and was strongly influenced by such men who had returned from Vietnam as modern day ANZACs. Upon graduating from senior, John had made up his mind where his career path laid. 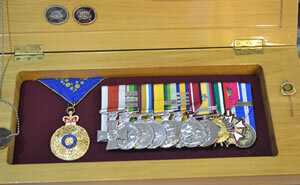 He applied for, and was accepted into the Australian Regular Army in 1974 with the rank of Private. Basic training and all the rigours of a new career in the Army filled his every waking hour. By 1980, at the age of 24, he had risen through the ranks to be Sergeant Cantwell of the Intelligence Corps, based in Brisbane. 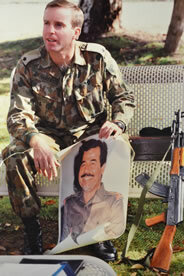 Cantwell's dedication to his chosen field saw him next accepted for an Officer Training Course in 1981, after only seven years in the Army. 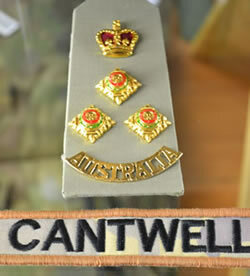 Upon successfully completing his course, Cantwell was commissioned as an Officer in the Royal Australian Armoured Corps. What followed as this man's career progressed can only be described as awe inspiring.